Real life group and private workshops anywhere in the world or online mentorships and online consults from the comfort of your home. Joel giving instructions at the Chicago workshop. © Janice D. Nelson. 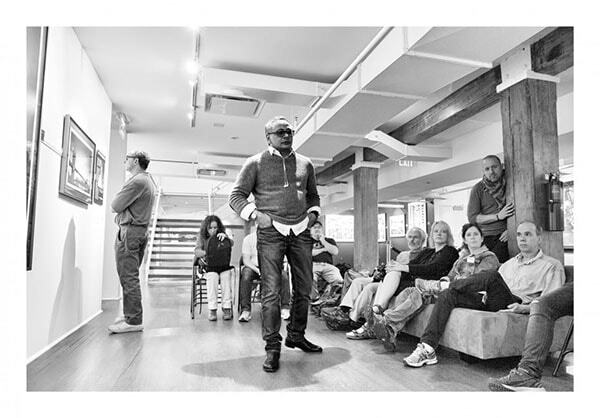 Joel talking about his fine-art prints at the New York City workshop. © David Fowler. If you’re interested in my workshops or mentorships then please scroll down this page and use one of the workshop specific contact forms. If you are interested in one of my other professional services or have general inquiries, then please fill out the contact form, by clicking the button below. Or e-mail me directly at: info.bwvision@gmail.com. B&W photography and post-processing: Since 2011 I’ve been teaching my iSGM2.0 method of B&W post-processing that has since become the B&W method for many award-winning photographers. From 2018 onwards I’ll be introducing and teaching the next evolution of this method to private workshop and mentorship students only. I’m calling it iSGM3.0 and now includes techniques for B&W post-processing and masking on which I’ve spent the last 2 years inventing, refining and then perfecting. They are the natural result of my personal skills and views on B&W photography and art in general. Therefore these techniques are out-of-the-box, yet, they touch the very essence of what B&W photography is and provide an almost 100% level of control and transparency in the way of working. It’s therefore very unlikely that these advanced techniques are in use or being taught anywhere else. I believe that the combination of these new techniques for processing and masking with the existing and more publicly known iSGM2.0 workflow, will enable the student to create any B&W photograph the student can possibly envision with a subtlety and control that is unmatched. If you are a photographer who likes to be on the forefront of what is possible in digital B&W photography, then I will put you there and show what’s beyond. Fine-art photography: Fine-art photography is more than just a beautiful B&W photo. It is also about intention, meaning and emotion. My ideas on Fine-art are supported not only by artistic/emotional motives but also by more scientifically based findings and the history of art. I can introduce you to the world of fine-art photography and to my personal ideas on what fine-art photography and what art in general is. With a few simple criteria, you will be able to separate art from everything else. Last but not least: I can teach you how to create fine-art photographs. Architectural Photography, landscape photography and still life photography: These are the genres I’m specialized in but that I always approach from a fine-art point of view, never from a commercial or editorial point of view. From 2010 to 2014 I’ve won all major international photography awards in those genres. My contribution to the evolution and development of fine-art architectural photography over the past years has been acknowledged by many photography lovers over the world. Exclusive Private and semi-private real-life workshops anywhere in the world. Note that the workshop fee doesn’t include your costs for traveling and accommodation. Click on the ‘I’m interested’ button below to indicate your preferences and to see the exact prices. If you have specific needs then feel free to indicate and ask for a quote. Prices only include workshop fees, your travel and accommodation are not included. Click on the “I’m interested” button below to see the prices per person, depending on the location. If your location is not mentioned, feel free to ask a quote. **NOTE: by filling out the forms for the private workshops, you only express your interest and there’s no commitment. If there’s sufficient interest for a private workshop in a specific location, this will result in the announcement of a private workshop with a fixed date for one specific location. These announcements can be found on the new ‘Workshop – news and events’ page and only run for a limited time. The prices of these announced events are always based on an attendance of 5 students and also come with a discount. Therefore those workshops always have a lower price than the lowest prices listed in the price lists. If you’re interested it is recommended to keep an eye on the ‘Workshop – news and events’ page. 1. B&W post-processing workshop focused on giving you the right tools and skills using my own developed and popular method of iSGM2.0 and the new iSGM3.0 (2018 and later) that gives you complete control over your black and white photograph to ensure it is perfectly aligned with your personal artistic vision. I will use those methods in combination with my B&W Artisan Pro panel. This also includes portfolio reviews and in-depth and detailed suggestions on how to improve. 2. A fine art architectural workshop in any location in the world for a maximum of 3 days. I’m specialized in architectural workshops in New York City, Paris, London, and Chicago. Of course, other locations around the world are also possible and I’m happy to advise you on that and give you the experience that fits your needs. 3. A long exposure photography workshop in any location in the world. This can be in any great architectural location in the world or specifically focused on long exposure seascapes. 4. A combination of all the above. Anything is possible, you provide your personal preferences, I will advise you on that and will suggest the best options including routes and hotel accommodations. – in the Netherlands and Belgium: varying from €475 to €1100 per person, depending on the number of students attending and 1 or 2 workshop days. Each private workshop will be concluded, 2 weeks after the workshop has taken place, with a 1-on-1 video-session (1.5 hrs) to review your work post-workshop and answer remaining questions. – anywhere else in the world: varying from $1347 (when 5 attend) for the cheapest workshop location outside of the Netherlands and Belgium (Berlin) up to $4850 (when only 1 attends) per person for a 3-day workshop in the most expensive location in Melbourne, Australia. The more students, the less the workshop fee per person. Each private workshop will be concluded, 2 weeks after the workshop has taken place, with a 1-on-1 video-session (1.5 hrs) to review your work post-workshop and answer remaining questions. If you don’t mind to have a semi-private workshop with one or max. four other students, then prices can decrease significantly since my personal expenses for travel/accommodations and fees will be spread out over the participants. Click on the “I’m interested buttons” for private workshops in NYC or anywhere else in the world, below, to see the prices per person, per location and number of attendees. Or click here for the prices for worldwide private workshops and here for the prices for private workshops in The Netherlands and Belgium. Note that the prices mentioned don’t include travel and accommodation for the student and note that you can still have a ‘full’ private workshop with other students that you’ve enlisted yourself. You can indicate all this via the ‘I’m interested’ buttons. If you are interested in a private workshop on B&W post-processing in The Netherlands or Belgium, please fill out the contact form, by clicking the button below. You will receive a quote from me. If you’re interested in a private workshop anywhere else on B&W post-processing and fine-art, then please fill out the contact form, by clicking the button below and check the exact prices. Duration: 6 – 8 Weeks, depending on the specific needs and experience, prices can vary too if more modules are added. Duration: 3 month minimum, with option to extend for 1 or more months. If you prefer to have a private online workshop from the comfort of your home, anywhere in the world, then I can offer you the following. 1. An online workshop focused on the art of black and white photography post-processing: the black and white private Masterclass. Duration 6 to 8 weeks using online one-on-one live video conference via Google+ or Skype and email/chat communication supported with pre-recorded HD video tutorials. Extensive portfolio reviews and real-time online demonstrations on how to improve are an essential part. 2. An online workshop focused on Long exposure photography: the Long Exposure Masterclass. Duration 6 to 8 weeks using online live one-on-one video chats via Google+ or Skype and email/chat communication supported with pre-recorded HD video tutorials. Extensive portfolio reviews and real-time online demonstrations on how to improve are an essential part. 3. A combination of both Black and White Photography private Masterclass and the Long Exposure Masterclass. Duration 6 to 8 weeks. 4. A private mentorship. This course is designed to guide you over a longer period of time, again using online tools like Google+ video hangouts or Skype video chats. A private mentorship will also allow going into what fine-art photography is and discuss related important topics that are important in the natural progress of an artist. The difference between a workshop and mentorship is that workshops are usually designed for acquiring a set of mostly practical skills within a limited period of time (6 to 8 weeks) while the mentorships are designed for acquiring the same practical skill sets over a longer period of time in which continuous evaluation is an essential part. There is more time to discuss topics, complete practical assignments and hence there’s a more realistic learning curve and a more realistic assessment of the progress. Due to the longer time frames, mentorships also allow for acquiring more theoretical knowledge and skills on top of the practical skills, that will give you broader insight into what fine art photography is. This allows you to not only know HOW to photograph and edit a scene but also WHY you do that and place that in a specific perspective, meaning: development of artistic vision will play a more prominent role in online mentorships. – online workshops: $600 for a 6-8 weeks course. Note that there will be discounts a few times per year. – online mentorships: $400 per month for an online mentorship of at least 3 months. After 3 months it will be assessed and advised if the mentorship should be extended for 1 or more months. If you live in the Netherlands you will have the option to have a one-on-one in-person meeting with me to shoot together for a small additional fee. If you live abroad then this is also an option but of course, this option will cost more depending on travel costs. If you are interested in an online workshop, then please fill out the form by clicking on the ‘I’m Interested’ button. I will contact you after receiving the form. A live portfolio review session including demonstrations will take around 2 hours. This live video session will be preceded by an email exchange with the images to be reviewed. For questions related to fine-art photography, architectural photography, long exposure photography and other topics that can be handled within around 1.5 hours. Many people who have attended one of my online or in person workshops know that I’m specialized in portfolio reviews. I always keep in mind the original vision and intention of the student/artist and I believe that this original and personal vision should always form the foundation of this portfolio review. Performing a review purely based on the technical merits of a photo is useless if you don’t know the artist’s intention. The review should always be inside the contextual boundaries of the artist’s artistic intention. Needless to say that I always respect the artistic intention, that is sacred. 1. Technical execution (basic camera skills, composition, etc.). 2. Black and white conversion (optional, if the photo is in B&W). 3. Realization and expression of the original artistic vision: “how did the artist express his vision and is this visual expression a logical and effective one, keeping in mind the artistic vision?” – this will include both criteria #1 and #2. Online portfolio reviews will include in-depth reviews of specific images with detailed suggestions and if needed on-line live video demonstration on how to improve. Besides online portfolio reviews, I also do video consults on anything related to black and white fine-art photography, architectural photography or long exposure photography. So if you have a question that can be handled in roughly less than 1.5 hours then you can fill out the form below and we will set a date together. – varying from $150 to $300 per portfolio review session depending on the needs, additional options and size of the portfolio. If more portfolio review sessions are needed, then discounted packages of max. 3 portfolio review sessions are possible. – live video consults are set at $130/hour (max. 1.5 hours). If you are interested in an online portfolio review, then please fill out the form by clicking on the ‘I’m Interested’ button. I will contact you after receiving the form. Real life workshops anywhere in the world for larger groups. Prices depend on location and size of the group. I haven’t conducted a public group workshop (> 10 students) since 2015 as I prefer the more extensive interaction and attention for the individual within a small group. It is therefore recommended to check my private workshops (1 to max. 5 students). As a professional fine art photographer I teach fine art architectural photography and Black and White photography post processing group workshops around the world on a regular basis, from Vienna to Melbourne to New York to Chicago. Any place is possible. Those are usually larger group workshops with around 20 students per workshop. In case you’re interested in such a workshop then keep an eye on any announcements I will post on this website or on my social media. If you are looking for a professional (fine art) photographer specialised in architecture, seascapes, automotive and still life photography in high quality black and white or color for your commercial needs, then I can provide you with a tailor made professional service and a quote for your specific needs. Other professional services include licensing of images for any commercial purpose. Please contact me at info.bwvision@gmail.com for more info. To get an impression of my work, other than architecture: please have a look at the few examples for which my work have been used, in the gallery below. Note: All prices of the above mentioned real life and online workshops are depending on the type of workshops, the location and the personal preferences. Of course, private online workshops are usually cheaper than real life workshops since the compensation for travel and accommodations are not included. At the same time, if you don’t mind to have a private workshop with one or max. two other students, then prices can decrease significantly since costs for travel/accommodations and fees will be spread out over the participants. I have met Joel Tjintjelaar in 2014 on one of the Vision Explorers workshops in New York where he was the presenter. I was very impressed with what I had learned at the workshop, but I wanted more. I had approached Joel about his one-on-one mentorship programs and I was successful in securing a spot. The mentorship program that Joel provides is extremely detailed and not an easy one to do. There is a lot of emphasis on background theory and history study of fine art photography as well as many practical assignments. Whilst there is a weekly structure in place to follow, there is also a room for an individual tailoring of the content. The weekly video chats were constructive with invaluable feedback. I could see my improvements in many aspects of fine art photography, to the degree that I have won one Gold award with the Australian Institute of Professional Photographers and several Silvers. I was also pleased to have received two Honorary Mentions from PX3 Prix de la Photographie Paris White competition, all under Joel’s guidance and mentoring, as well as several Silver and Bronze awards in the International Loupe Awards. I am planning to continue with the advanced mentorship program with Joel next year. I have known Joel for 6 months and I consider him to be one of the best BW fine art photographers. He has his very personal and unambiguous style of photography. The photos have delicacy and are delightful with magical beauty. For me these fine art photos are true master pieces. These master pieces have triggered my passion for BW photography. Before that moment I was dissatisfied with my photos and I have been searching for a personal style. Joel changed all of this. Since January, 2014 I am very proud and honoured to be one of his mentor students. During the first video chats I knew that he ís a Master (as well as an open person). In the beginning he taught me his techniques in a very interactive way and always open for discussion and questions. Joel states that “technique and post processing is a very crucial aspect but to develop your personal style/vision is the most important and at the same time the most difficult aspect in fine art photography”. How to become an artist? We talk and discuss a lot about personal style and vision, actually it takes most of our time. The combination of a unique artistic personality and the outstanding teaching qualities make Joel the perfect mentor. In April, 2014 we met for the first time in New York City during a Vision Explorers Fine Art Architectural Photography Workshop. It was a great time and it turned out that he is also a fabulous and outstanding teacher/mentor in the field. During a portfolio discussion I had the opportunity to show two of my BW fine art photos that I made the last three months in the class room in front of the others. The reviews were excellent and Joel showed his enthusiasm and told me that he was very proud. I have known Joel for some time now and he has become a special friend. He has and always will be my mentor. Remembering my first encounters, Joel introduced me to the masters of art and how they relate to photography. There was the introduction to the pioneers of photography from the early to mid 20th century. Then we segued into everything “Fine Art Photography Black and White – Architecture.” This was followed by a workup inside the digital darkroom, my final albatross! Through Joel’s patience, persistence, and encouragement I managed to get through the hazards of Photoshop propelling me to numerous national and international awards. Joel, ever the innovator developed a breakthrough for creating complex intricate selections with his “Quick Mask Pro Panel.” One of the tedious evils of processing images in the digital darkroom is creating selections. Selections involving towering buildings with cranes, spires with their numerous tentacle-like antennas and communication discs, cityscapes with suspension bridges and their endless network of cables, and portraits with flowing or windblown hair all will look more accurate and natural. Selections that cost us precious time are over with Quick Mask Pro. This cutting-edge development is based on creating hard selections with accurate soft edges. This sounds like a contradiction, however, in reality, the human eye is only capable in seeing edges that appear sharp, but have compensated visually with a degree of softness. With a click of a few buttons, selections that normally may take hours or days can be completed in a matter of minutes. The efficiency, accuracy, and clarity is truly amazing and you are in complete control of defining the edge. Joel’s next breakthrough came with his cutting edge “Artisan Pro Panel.” We all know about the complexity for creating luminosity masks, conversion to black and white, merging, working hard selections with the gradient tool, and working hard selections with the gradient tool and luminosity mask. These processes cost us precious time and sometimes frustration creating a natural image in keeping with your high standards and levels of expectations. This is no longer the case. “Artisan Pro” has all the above features built in. Simply allow your vision to create unparalleled lights and shadows with emotion by drawing carefree selections with the lasso tool and with the click of a button from the panel, viewers will take pause and admire your fine art. Interested in black and white split toning? Joel has incorporated this feature into his “Artisan Pro Panel” as well. Results are stunning, subtle, and natural with you in command for fast efficient post-processing. This traditional intimidation factor has been simplified while using Photoshop as the host for his two panels. Additionally, Joel has made available video tutorials and written guidelines as an aid for an easy introduction for both panels. The panels are also evolutionary as Joel is always fine-tuning or adding further innovative components as updates. There are an abundance mentors who can teach technical skills for fine art photography but if your ready to take the next step and want your creations to speak with soul and emotion Joel is unrivaled. If you are interested in simplifying and become more efficient with fine art post processing then consider his “Quick Mask Pro” and “Artisan Pro” panels.